American Oversight has obtained the resumes of Trump administration political appointees at the Department of Education from 2017 and 2018 that offer yet another example of how Secretary Betsy DeVos has prioritized charter schools and for-profit institutions over public education. On Wednesday, DeVos testified about her department’s policies and priorities in front of the House Education and Labor Committee, and faced questions about department policy favoring those industries. Out of 61 resumes American Oversight obtained, 11 political appointees had served on the Trump campaign prior to joining the administration — but only seven have any experience teaching in or overseeing traditional public schools. Through FOIA litigation, American Oversight has obtained hundreds of resumes of Trump administration appointees from across the administration. Unqualified officials who list their Trump campaign experience or loyalty to the administration are not uncommon. But the lack of expertise in education, specifically public education, at the Education Department at the beginning of the administration is illustrative of the agency’s priorities. Robert Goad, a Department of Education policy adviser, had most recently worked on policy for the Trump campaign. According to Politico, Goad helped Trump craft his $20 billion plan to expand access to charter schools and private school vouchers. Goad also proposed making colleges share some of the responsibility if students are unable to pay back their loans. Cody Reynolds joined the administration as a special assistant to the secretary after working for the Trump campaign, as well as a variety of other campaigns, with almost no experience related to education. Derrick Bolen, who served as a confidential assistant and whose brief professional experience included nothing but campaign work, worked as the Youth for Trump Virginia director and for the Republican Party of Virginia. Bolen was later transferred to the Department of Labor and then to the Environmental Protection Agency, according to ProPublica. A week after Trump’s inauguration, Politico reported that several Education Department appointees had shared racist, sexist, and transphobic posts on social media. Bolen was mentioned in the article, along with Teresa UnRue, Kevin Eck, and Beatriz Ramos. Jason Louis Botel, who served as the senior White House adviser and later as the principal deputy assistant secretary at the Department of Education, listed just three years of public education experience on his resume, but nearly 15 years of charter school or charter advocacy experience. Botel was the founding principal of KIPP Ujima Village Academy and then the executive director of KIPP Baltimore. Both are part of the largest network of charter schools in the United States. Before Botel joined the administration, he was the executive director of MarylandCAN, the state branch of education reform group 50CAN, which has supported pro-charter policies. Of course, the pro-charter slant of the Department of Education starts at the top: DeVos herself has no background in public education, and didn’t attend a public school. Neither did her four children. American Oversight has been investigating DeVos since 2017 and obtained the calendars from her first six months at the agency. Her schedule reveals a heavy focus on meeting with representatives of religious and charter schools over those of public schools. 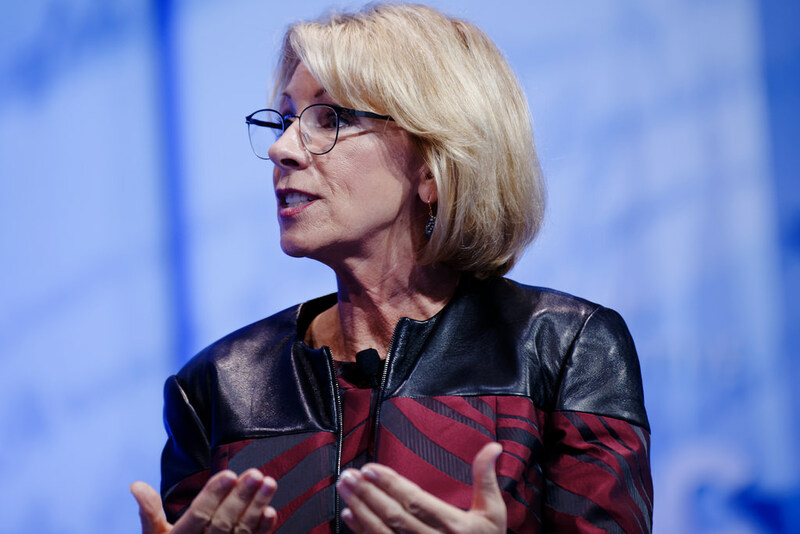 Under DeVos’ leadership, the department has made many changes in favor of for-profit institutions and special interests in higher education, including the decision to roll back the Gainful Employment Rule, the Borrower Defense Rule, and other regulations.